The purpose of this project is to incorporate employability skills (teamwork, problem solving, verbal communication, written communication, dependability/work ethic, and planning and organizing skills) into activities that are related to the design and basic production quality control for BMX bike pedals. 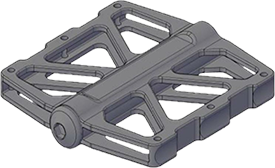 Activity 1: Design of the part with the use of CAD/CAM tools (Autocad 2017), with existing technical specifications and using two different units of measurement (millimeters and inches). The project teams will execute the design. Activity 2: CNC programming will be used (including specific hardware and software tools) for final production of the CAD designed part (produced from Activity 1). During this activity, the project team uses earlier data to provide general guidelines for the correct connection process for CNC hardware (steps for the connection of the hardware need to be analyzed and correctly organized prior to final execution). Several samples of the pedal will be produced. Activity 3: Quality control for manufactured bike pedals (produced from Activity 2). The company team is now responsible for executing quality control over the finished parts. The company is known for having experience on implementing Statistical Process Control (SPC) as a tool for quality assessment (working with tolerances and application different Cpk indicators, for example 1.33, 1.67 & 2.0). Activity 4: The company team will deliver a final official presentation to the CEO of the company for final approval of the pedal. The team will introduce the main ideas for the project as well as main details of each prior executed activity (1, 2 and 3). As part of the presentation responsibilities, the team will be in charge of contacting the A/V department to take care of the presentation’s technical needs (video projector, computer, etc.). As part of the presentation scenario, an instructor may choose to introduce a “bug” or technical problem with the presentation equipment (i.e., unplugged or switched video projector/computer cables, etc.) for the presentation team to work through and solve to make the presentation equipment operable.